A short summary of events in the Kerch Strait on November 25, 2018 based on sources in the Ukrainian General Staff and the Ukrainian Navy command. On the night of November 24 to 25, a group of Ukrainian Navy ships conducted a planned move from Odesa to Mariupol. The group consisted of the tugboat “Yany Kapu” and two small armored artillery boats, “Berdiansk” and “Nikopol.” They have informed the Russians according to international navigation rules of plans to pass the Kerch Strait into the Azov Sea. Russians had no right to interfere or block the vessels, as freedom of navigation in the Kerch Strait is guaranteed under the UN Convention on the Law of the Sea. However, the group has not only received no answer, but was later intimidated, rammed, the strait closed physically by a tanker. In the evening of November 25, Russian ships opened fire at a Ukrainian naval group when it was already leaving the 12-mile zone, damaging one boat and wounding one Ukrainian serviceman. Let’s look at how the crisis in the Kerch Strait emerged. According to international rules of the sea navigation safety, the Berdiansk small armored artillery boat of the Ukrainian Navy is calling the coastal post of the Russian FSB border guards, as well as ports “Kerch” and “Kavkaz” dispatchers and informs them about its intent to pass the Kerch Strait. It receives no answer. The Ukrainian Navy intercepts the conversation of a dispatcher of “Kerch” port informing the Russian Navy ship “Suzdalets” on Ukrainian Navy ships in the strait. “Kerch” and “Kavkaz” ports continue to totally ignore the Ukrainian Navy's requests in the radio wave. In clear violation of the UN Convention on the Law of the Sea as well as the 2003 agreement between Russia and Ukraine on joint use of the Sea of Azov, Russian border guards begin to aggressively intimidate Ukrainian ships. 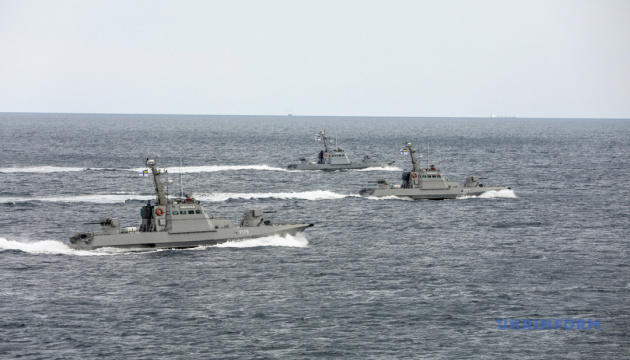 Russian patrol boats, type “Sobol”, search and rescue intelligence ship “Don”, boats of “Mangust” type, search ship “Suzdalets” approach the Ukrainian naval group. “Don” rams the Ukrainian tugboat “Yany Kapu”, damaging its main engine, shell plating and guard rail. A life raft of the tug is lost. Russian dispatchers continue to ignore Ukrainian Navy messages, trying to notify on the planned passing through the Kerch Strait. Despite Russian provocative actions, the Ukrainian naval group continues its way to the port of Mariupol, approaching the bridge in the Kerch Strait. The Ukrainian General Staff informs that two small artillery boats and a tugboat are moving according to the freedom of navigation guaranteed by international law. The Ukrainian Ministry of Foreign Affairs issues a statement calling Russian actions “aggressive,” saying they crossed the red line and violated the UN Convention on the Law of the Sea. Two Russian combat helicopters Ka-52 are approaching on a combat course, aiming their weapons at Ukrainian Navy boats. Russians take right into the strait a giant tanker, which stood on repair in the Kerch port, and stop it under the bridge to completely block the navigation. The tanker has its navigation system switched off. Ukraine's Permanent Representative to the UN Volodymyr Yelchenko says he immediately addresses the UN Security Council due to the situation in the Kerch Strait. 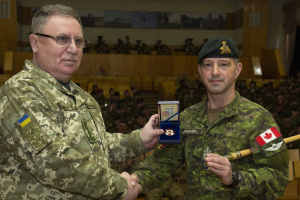 A Ukrainian naval group begins to return to avoid further escalation. Russian forces chase the group and put forward ultimatums to stop, threatening to use weapons. Ukrainian Navy ships continue movement. Meanwhile, trade vessels continue to gather on both sides of the strait being unable to pass it. After Ukrainian Navy ships already leave the 12-mile coastal zone, Russian border guards open fire at them. Ukrainian small armored artillery boat “Nikopol” is damaged and loses speed. One crew member is wounded. Ukrainian Navy ships are given order to fire back. Two small armored artillery boats damaged by Russian fire, Ukrainian Navy reports, they stop. Seatug “Yany Kapu” has to stop too. Ships are seized by the Russian special forces. 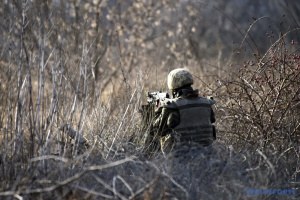 Two Ukrainian servicemen are wounded. Ukrainian President Petro Poroshenko calls for a War Cabinet urgent meeting due to the “extraordinary” events in the Kerch Strait. The Berdiansk small armored artillery boat and the Yany Kapu tugboat are being towed. The Nikopol small armored artillery boat has been blocked and is being escorted by invaders. 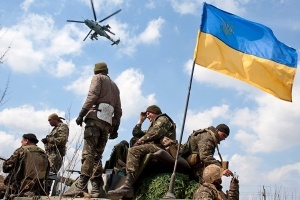 Six Ukrainian servicemen were wounded, according to the press center of the command of the Ukrainian Navy. Ukrainian Navy ships were using their freedom of navigation guaranteed under articles 17, 38 of the UN Convention on the Law of the Sea (UNCLOS) and article 2 of the agreement between Russia and Ukraine on cooperation on use of the Sea of Azov and the Kerch Strait. Under the quoted articles, they are allowed to pass the Kerch Strait at any time taking into account safety of navigation is secured. Russia blatantly violated all mentioned articles. Article 17 of UNCLOS: “...ships of all States, whether coastal or land-locked, enjoy the right of innocent passage through the territorial sea”. Article 38 of UNCLOS, part 1: “...all ships and aircraft enjoy the right of transit passage, which shall not be impeded”. 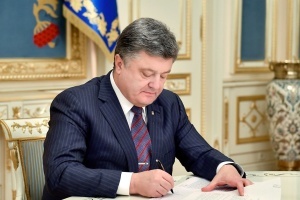 Article 2 of the Russian-Ukrainian agreement on joint use of the Sea of Azov and the Kerch Strait: “Trade vessels and navy ships as well as other ships under flags of the Russian Federation and Ukraine, which are used in non-commercial aims, enjoy freedom of navigation in the Sea of Azov and the Kerch Strait”. Ukrainian Navy also underlined that the event in which a Ukrainian tugboat was rammed by a Russian ship was already an act of aggression as qualified by the Resolution #3314 (XXIX) of the UN General Assembly dated December 14, 1974. Not to say that opening fire at Ukrainian Navy ships is considered an act of aggression and can sparkle further escalation of war between Russia and Ukraine. Regardless of the further development of events, there is already a grave escalation of tensions in the Kerch Strait which can sparkle a wider escalation of war between Russia and Ukraine. Russian actions are a clear violation of the UN convention and the treaty of 2003 on the joint use of the Azov Sea and the Kerch Strait. Earlier this year Ukraine initiated an international arbitrary trial against Russia in The Hague for violating the UN Convention on the Law of the Sea. Today’s events show an example of such violation of UNCLOS of a scope that has not been seen before, and leaves very little space for the international arbitrary trial to rule in favour of Russia, not Ukraine, in the matter.